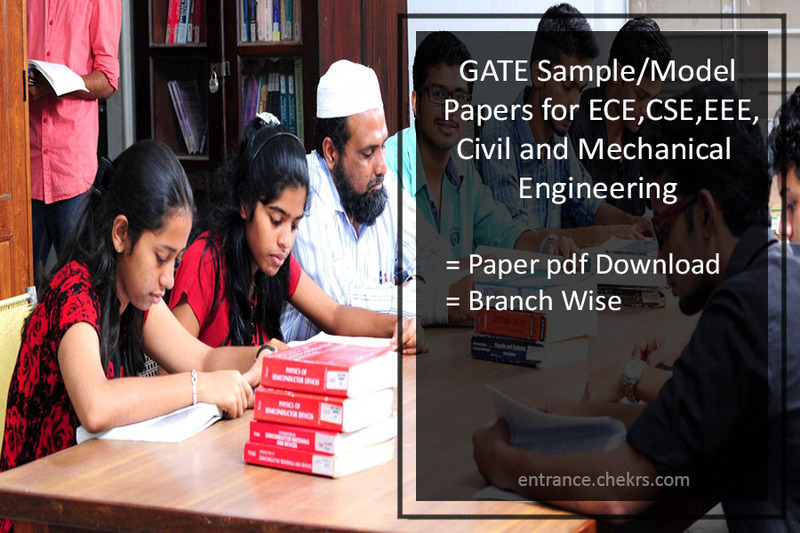 GATE Sample Papers for ECE, EEE, CSE, Mechanical and Civil: The Graduate Aptitude Test in Engineering will be conducted in the month of January/February 2020. The aspirants who are preparing for the exam, they are advised to solve the GATE Sample papers for their revisions. The regular practice will help them to understand the types and variety of the questions which will be asked in the exam. The GATE 2020 Sample Paper for ECE are available here. The aspirants who will solve them they have more chances to crack the GATE 2020 Exam. The GATE Exam is one of the toughest exams of engineering. The aspirants who have successfully applied for the exam, they can now start their preparations. They are advised to practice the GATE Model Paper for EEE so that they can get the proper efficiency to complete the exam on time. The students must check the GATE EEE Previous Year Papers before starting their preparations. The aspirants should know the quality and difficulty level of the exam and for that, they have to solve the GATE Model Paper for ECE. The model paper will include all the variety and type of questions which can be asked in the exam. The solutions for such papers are available at the end of the question paper. Also, Check GATE ECE Previous Year Papers. The Graduate Aptitude test in engineering will include the questions of General aptitude, engineering mathematics and core subjects. The aspirants who will solve the GATE Model Paper for Civil, they have the opportunity to score high in the exam. The model papers and Civil Previous Year papers will cover all the syllabus of the particular branch for which the aspirants have applied. They will also get to know about the exam pattern of the GATE 2020. The computer science branch is the most popular branch for the IITs and NITs. Last year around nine lakh students appeared for the exam which means the competition will be tougher than the last year. The aspirants have to prepare according to the competition and they have to solve CSE Previous Year Papers if they want to get selected. They are required to practice GATE Model papers for CSE on daily basis. The aspirants who go on with the advice has more chances to get selected in the exam. The GATE is one the prestigious exam of engineering in India. The aspirants should know about every single detail about the exam if they are competing for it. The GATE Model Papers for Mechanical pdf is given in the table given below. The aspirants can solve the GATE Mechanical Previous year papers for their revision of the syllabus for the exam. The Graduate Aptitude Test in Engineering is conducted for the aspirants who are seeking admissions in the IITs and NITs for their Post Graduation. Nowadays some PSUs also provides jobs on the basis of the GATE Scorecard. Every year around eight to ten lakh students appears for the exam. The exam is mainly conducted in Jan or Feb.
For more queries you can comment in the comment section given below.